I’m back from my trip! And I have a lot of updates about “The New Adventures of Peter and Wendy.” For starters, we won the 2015 Geekie Award for Best Scripted series! Also, a couple of weeks back, me and a few other members of the “New Peter and Wendy” cast and crew appeared on the StoryForward podcast to talk about the show. In addition to the podcast, StoryForward is a monthly transmedia meetup here in Los Angeles, join the meetup group if you’re interested in coming to check it out. 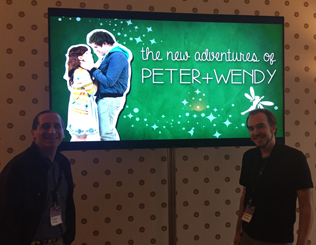 Lastly, earlier this week, I posted a blog on the “New Peter and Wendy” site about my experience representing the show in Frankfurt, Amsterdam and London during my just-completed speaking tour. So now I’m reblogging that here, for you Coefficient of Fiction readers. Stay tuned to this space: Lots more coming up! Ahoy hoy, Neverlandians! Emmett Furey here, intrepid transmedia producer. I haven’t said too much on this side of the “New Adventures of Peter and Wendy” experience up to this point; in part, because I’m generally entirely immersed in the in-world transmedia experience, but also because, on a certain level, a transmedia producer’s job is to remain invisible. I mean, technically that’s true of all of the amazing people who work behind the scenes to produce the show, but since I’m one of the few who has an active narrative role during the period of the show’s release, my relationship to the material at that stage is a little different. But, in the past few weeks, I had the incredible opportunity to travel internationally, to spread the word about our show far and wide outside our native U.S. of A. And I thought now was finally the right time to break my out-of-world silence and tell you all about it. The first leg of our journey starts in Frankfurt, Germany, at the B3 Biennale of the Moving Image, a conference that brings together creatives of wildly disparate stripes from the far corners of the globe to discuss the past, present and future of our respective mediums. My contribution was crammed into the morning of Saturday, October 10th, when I sat on a transmedia panel, introduced a big-screen screening of the first half of the first season of “The New Adventures of Peter and Wendy,” and taught a master class in social media storytelling. I didn’t get to actually see any of the screening, because most of it overlapped with my talk, but I’m told it went over incredibly well. And I’m not going to name drop here, but an old friend and longtime writer for “The Simpsons” (and when I say “longtime,” I mean longer than many of our fans have been alive) stayed for the entire screening, loving every minute of it. Then he caught the end of my class, where I was able to tell him about the transmedia experience. Everyone at “New Peter and Wendy,” not least of all me, was incredibly excited to learn that a staple of a show that was so formative to our generation is now, also, a fan of ours. I had an amazing time at the B3, and I can’t thank them enough for inviting me to participate; if not for them, this entire trip would not have been possible. This was, by the way, this dubiously uncultured American’s first opportunity to travel outside of the continental United States, so it was an exciting experience for me on a lot of levels. Next up in our journey is VU university in Amsterdam. Every year, J.L.L. Veugen, a professor in the university’s Comparative Arts and Media Studies master’s program, teaches a class on transmedia; a class where, on Tuesday, 10/13, I was fortunate enough to be able to guest lecture. For the past three or four years, students in Professor Veugen’s class have been doing case studies on some of my transmedia projects. I first became aware of this a few years back when one such student reached out to me online and asked if I could answer a few questions for her. This resulted in me having numerous Skype sessions with her, Skyping into the class that year, and opening up a dialogue with Professor Veugen. An old high school friend of mine and his wife now live in Amsterdam, and I was already planning to take a few days after the B3 and visit them. It just so happened that one session of Professor Veugen’s 2015 transmedia class fell squarely within the days of my Amsterdam stay, and it was thus that I was able to spread the gospel of “New Peter and Wendy” to some bright, young minds of the far off Netherlands. Last stop on our trip is London, England. I don’t know very many people in London, but I’ve wanted to see the city for a long time, and I didn’t want to pass up a chance to go while I was in that part of the world. And in another happy accident, my friend and colleague Robert Pratten’s Conducttr transmedia conference was happening on Friday, 10/16; again, exactly when I was planning to be in town. While I was there, I met a great many transmedia pioneers, who were, themselves, quite keen to learn about the happenings of the little town in Ohio called Neverland. So, all in all, guys, I think the “New Peter and Wendy” fanbase just got a little more international! It’s worth mentioning that in all of these talks, I spoke more about “New Peter and Wendy” than I did about any other project I’ve worked on. Because it has the best stories. Because it has the best fans. Because we trust you roleplayers enough to give you more agency in the story world than most any property has in history of narrative, and the fruits of your labor is nothing short of a gift; to all of us who make the show, and to the entire Pan fandom. Thanks to all of you, “The New Adventures of Peter and Wendy” is, truly, an act of co-creation. You create multiple character accounts to tell complex, serialized stories, just like we do. You have Google hangouts to plot your characters’ story arcs over the course of the show, just like we do. The stories you tell affects the stories we tell, and vice versa. And you’ve learned that the simple act of playing in this world is enough to create lasting friendships in the real one; just like we have. We’ve got one more year to go in our little adventure, and I truly believe that thanks to you guys, the world of “New Peter and Wendy” will go on long after our part in the saga is over and done with. And I, for one, find that extraordinary. Like I said in our IAWTV Awards acceptance speech, without all of you, what I do would be a lot of sound and fury, signifying nothing. And thanks to you, “The New Adventures of Peter and Wendy” has been one of the most fulfilling creative experiences in my life to date. So keep doing what you’re doing, Neverlandians. You make us want to be a better show. And the ride ain’t over yet!